Do you routinely hide your teeth in pictures because you don’t want people to see your imperfect teeth? Stains, chips, cracks, and gaps affect countless patients, but we can help them achieve the smiles of their dreams thanks to cosmetic dentistry. 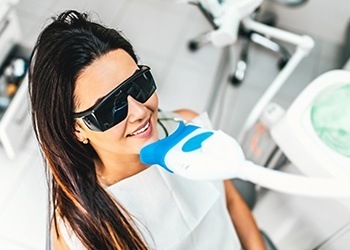 In just one or up to a few appointments, we can make any smile flaw disappear and give you beautiful, natural-looking results you’ll be eager to show off at every opportunity. With us, the only limit is your imagination! To learn more about what we can do for you with cosmetic dentistry, contact us today. 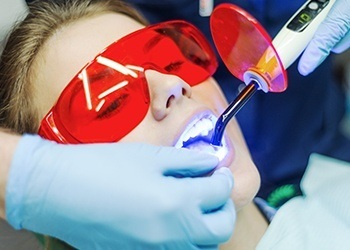 Why Choose Powell Dental Group for Cosmetic Dentistry? No matter what kind of smile imperfection you might have, porcelain veneers can likely make it a thing of the past. 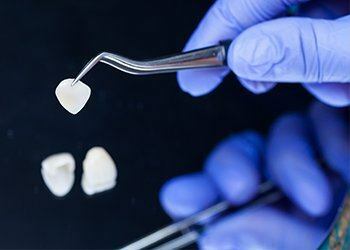 Thin pieces of ceramic are designed to look like pristine enamel, and these are fitted over the front of the teeth to change their shape, size, and color to whatever a patient wants. They are always custom-made, so whether you’re looking to improve one tooth or completely transform your smile, veneers can make it happen in just two easy appointments. 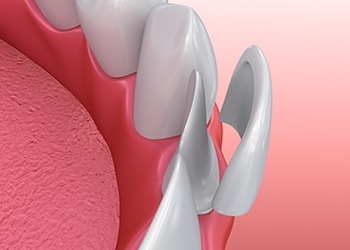 Composite veneers work by placing a thin layer of a composite resin over the front of the teeth, and then your dentist will shape and sculpt it to give your smile the ideal appearance. This is a more conservative and affordable option compared to porcelain veneers, but it’s still able to deliver dramatic results. This enables our team to improve the smile without actually altering the natural teeth, which some patients prefer. Dental crowns used to only be made of silver and gold, which made them less than ideal for repairing teeth that show prominently in the smile. Thankfully, we’re now able to provide 100% porcelain crowns that can mimic the strength and appearance of enamel perfectly. Able to fully repair decayed and damaged teeth, this is the kind of dental work that ends up looking nothing like dental work. Only you and your dentist will be able to tell which tooth has been restored! We can get rid of small chips, gaps, and stains in just an hour or less using direct bonding. Your dentist will simply cover a compromised tooth with some composite resin, and this will be shaped to mask any flaw you can imagine. The resin will then be hardened into place, and that’s it! Not only is this procedure fast, but completely painless as well, plus patients can look forward to their results lasting for up to a decade. Have a wedding, date, or job interview coming up, and you want your smile to make the best impression possible? We can get rid of stubborn coffee, wine, and tobacco stains in just an hour with our in-office Professional and Prescription Strength Whitening System. 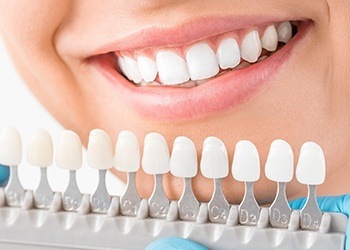 Using a combination of a powerful bleaching gel and a luminous mouthpiece that helps it break up stains even faster, we can easily make your smile 6-8 shades brighter in just one quick appointment. As an additional benefit, you will also receive the Glo Whitening system to keep, which is rechargeable and sharable with your whole family! Want to give yourself a beautifully white smile at home while you surf the web or binge your favorite show? We can help you do exactly that by providing you with a custom-made whitening kit. It will consist of a bleaching gel much more concentrated than anything you can buy on your own as well as the rechargeable Glo Whitening System. 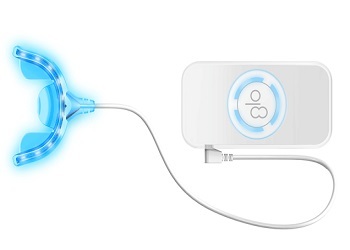 The Glo Whitening system can be worn on a chain while you to go about your day. Simply use our kit daily as often as you need it, and you’ll see as your teeth become dramatically whiter right before your eyes! D3 Clear Aligners enable patients to effectively straighten their crooked/crowded teeth without having to get bulky metal braces. 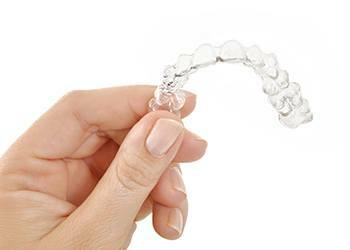 Patients only have to wear a series of clear, lightweight aligners that easily slip on and off of the teeth. They are so subtle-looking that friends and coworkers will never notice you’re using D3 Clear Aligners, and thanks to our digital design system (in which we use a 3D model of your teeth), we can ensure your treatment will have the perfect fit from beginning to end. They are available for a fraction of the cost that traditional aligners are sold for!